Human male former soldier turned ranger. Lee is just a really tough guy who just wants the best for others without people being ridiculous. Born Angaid Comhan in the Neverwinter Woods, Lee’s life began with his mom, Fionn Buids, and his father, Grand Ciaran Comhan. 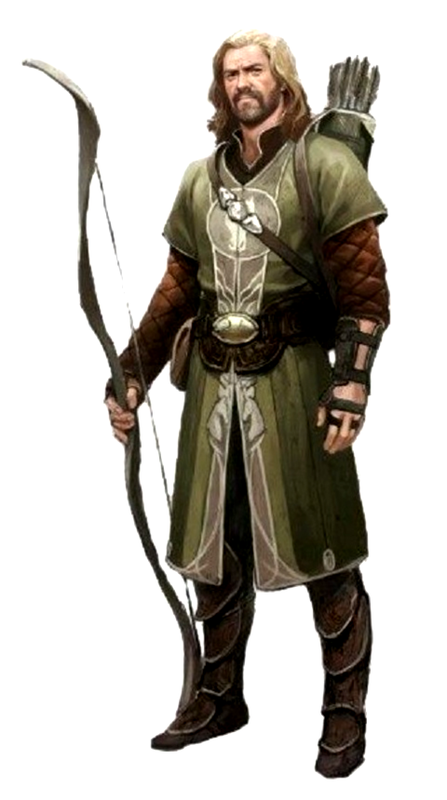 His parents were both druids of the Emerald Enclave, and Lee was born next in line to be one of the clan council members. The clan council was made of three men and three women who voted on all issues of the Emerald Enclave and the family name Comhan had an important force in the council. Most of his life only involved discussing the basis of debate and the rare books on politics to prepare him for his council role, never allowing him to venture out into the woods or hunt for the group. As Lee’s druid training went on, he caught onto the debate aspects of his role, but he never could grasp druidic magic, he was always shunned and mocked for his inability to transform. He was also never good with any weapons, he was only alright with the rare longbow. After twenty years of this being his whole life, Lee grew sick of the Emerald Enclave, Lee felt they took advantage of him without the group giving anything to him. His hatred climaxed in an epic debate between his father and himself that ended in Lee running out of the wood and trying to find the nearest city, a thing he had only heard of. Lee ran down the river to find the city of Thundertree. Lee stayed there as a mercenary in the city for two years, making only enough money to survive. He stayed right up until he saw a member of the Emerald Enclave enter the city, and this scared him so bad he ran from his life in Thundertree, and made his way into Neverwinter. In Neverwinter Lee met Nora Srour, a strange woman from a far off land. These two quickly connected, and a year into Lee’s life in Neverwinter they both moved to Mintarn, far to the Southwest. Now, at 23, Lee was far away from his past and happier than he ever had been. Lee joined the Victory Division, a traveling group of mercenaries that went across the world finding work. Two years into his service Lee proposed to his wife, forever binding them in marriage. Lee grew disillusioned with his fellow soldiers, who seem to enjoy their authority at the expense of the people they’re supposed to protect. Everything came to a head when Lee disobeyed an order and followed his conscience. Lee was suspended from active duty, though he kept his rank and his connection to the mercenaries. Since then, he has been more reclusive. Eventually, after 20 years of traveling one year at a time and then going back home for a year Lee’s service brought him back to Thundertree. Lee was so fearful that the Emerald Enclave would find him, he deserted from his group and ran into the woods. He stayed in the woods in contemplation and blind rage, watching and hiding from his old druid clan for five years, learning the skills of sneaking and survival. After these five years Lee set up a makeshift prayer pad in the forest, where he accepted that he should go back towards his group and had made a grave mistake. When he fell asleep that night he was given visions of his wife being slaughtered and himself being shunned by the Emerald Enclave. He woke up, and ran as fast as he could so he could get home to Mintran. He got home to Mintran at age 46, finding his wife to be nowhere in sight and no sign of where she went. Lee quickly blamed the Emerald Enclave for his situation, and went into an investigation of what happened to his wife for fifteen years. At age 61, he finally found out that his wife had passed away due to some food borne illness and Lee quickly vowed that this was because of the Emerald Enclave and dropped his old name and took up the mantle Lee. He went back to Neverwinter, reaching the ripe old age of 62, preparing to go take revenge on the Emerald Enclave, but before he could carry out the act when Sildar brought his attention to the group.